We’re excited to be one of the small, lesser-known putter manufacturers featured in this week’s Golf Digest Stix e-magazine. Little Brands, Big Dreams indeed. Men’s Journal Magazine recently reviewed the Model BG-1 Complete Package and posted the article to the Gear Lab section of their website. 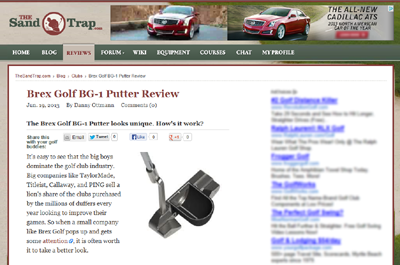 The coverage and enthusiasm for the Model BG-1 putter and Complete Package is building!